Home > Diving > What is Coasteering? 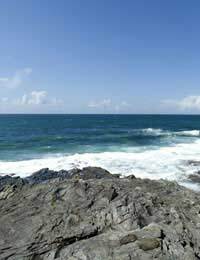 The relatively new adventure activity of coasteering is all about getting wet swimming and jumping and scrambling round rocks. It’s also a great way to experience the wonders of the natural coastline. Coasteering is a wild fusion of rock climbing, scrambling, swimming and cliff jumping and a full on adrenalin activity guaranteed to get the heart throbbing and the blood rushing. It is a primitive activity with no equipment such as ropes or climbing harnesses, just basic safety wear, enabling total freedom of movement. The UK’s fastest growing adventure sport is all about taking an exciting active appreciation in our natural coastline; exploring hidden caves and rocky outcrops and observing the fascinating wildlife. It involves negotiating sea cliffs close to the water, short swims and a few jumps from the cliffs into the sea. The activity was first developed in Pembrokeshire, Wales, in the 1980s and 90s and has since taken off all over the world. Coasteering is potentially very dangerous if not carried out under the supervision of qualified and experienced instructors and should not be tackled independently. The relatively recent emergence on the water activity scene means that no national regulatory control has yet been established. However, although instructors will not be officially qualified in the art of coasteering, this does not mean this is an amateur exercise with no professional instruction. Most activity providers adhere to a best practice policy and their instructors have minimum NGB (National Governing Body) qualifications, such as mountain leader, SPA (Single Pitch Award), level 2 REC first aid, as well as lots of previous coasteering experience with in-house training. Before joining an activity group it is wise to first consider the qualification of the instruction team. After a safety demonstration and technique briefing, novice coasteerers acclimatise to the activity by beginning with short swims, small jumps and low level cliff traversing. As they get used to swimming in the sea and their confidence and buzz steadily increases, they then typically move on to bigger jumps and longer swims across coves to small rocky islands. The jumps can be from as low as one foot up to 20 feet, depending on the coasteerer’s confidence. People of all ages and abilities can join in coasteering. Participants don’t have to be especially fit – although being especially unfit could be problematic – just able to swim confidently. As an adventure activity it requires a lot of energy and by the end coasteerers usually feel very tired and drained. Coasteering is most popular in the summer time when the water is at its warmest and the weather is at its most forgiving. Nevertheless there are those that prefer the swell and blustery thrill that emerges late in the season. Coasteering should under no circumstances be attempted without the correct equipment and clothing. All activity centres will provide the necessary wetsuits, buoyancy aids, watersports helmets and cagoules as part of the package. Participants will likely be expected to take along some strong, sturdy footwear that they don’t mind getting wet, as well as their swimming gear, some thermal long sleeved garments and a towel.